Almost 100 people were arrested in a prescription drug crackdown in New York City and Long Island on June 6. While at least one article on the subject focused its headline on doctors, only two physicians (along with one nurse) were among those charged. Also charged was the manager of a physician’s office in Staten Island, who allegedly forged prescriptions for his friends. The bulk of those arrested, however, were people who forged or stole prescriptions, or who went “doctor shopping” to obtain multiple prescriptions. One Staten Island resident obtained nearly 1,800 pills in a one-month period by filling eight prescriptions from seven different doctors. A number of people were also charged with trafficking in prescription drugs such as klonopin, methadone and oxycodone. And one doctor allegedly prescribed over three quarters of a million oxycodone pills over a period of less than two years. Oxycodone is an opiate related to morphine, and is marketed under various names, including OxyContin. The police operation was prompted by a growing concern over the abuse of prescription painkillers and other medications, which has been blamed for at least two deadly incidents over the past year. They include the robbery of a pharmacy in Suffolk County that resulted in the murder of four people, and another pharmacy robbery in Nassau County in which a federal agent was killed. The problem of prescription drug abuse has reached epidemic proportions, according to the Centers for Disease Control and Prevention, which states that “[p]rescription drug abuse is the fastest growing drug problem in the United States.” Locally, the New York City of Health and Mental Hygiene published a bulletin in December on the subject, focusing on what doctors and dentists can do to avoid contributing to the problem of the abuse of prescription painkillers. The bulletin targets opioids such as OxyContin, Percocet, Percodan and Vicodin, and stresses the importance of limiting prescriptions of such drugs to a three day supply in the case of acute pain, and avoiding their use to alleviate chronic non-cancer pain. The Department also detailed the health risks associated with these drugs, which include, in addition to dependence, withdrawal and addiction, effects ranging from dry skin to fatal overdoses caused by respiratory depression. 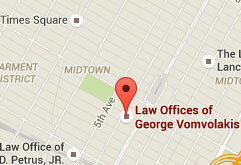 At the Law Offices of George Vomvolakis, we understand how drug addiction can affect your life. If you have been charged with possession of illegal prescription or other drugs, or any other drug offense, contact an experienced New York drug lawyer to protect your interests.